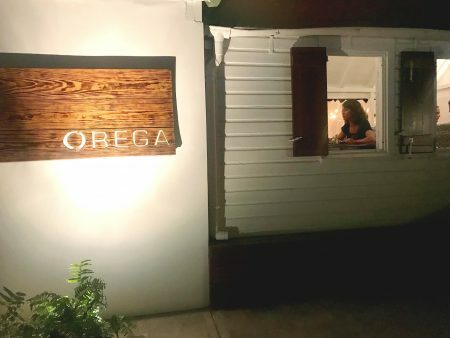 La Bagatelle, Shellona, La Guérite and Orega reopen on time! Departing from Boston via Miami and then via St. Maarten, SBP VP and my son, Tom Smyth arrived December11th and reported a smooth transfer from SXM to St. Barth. 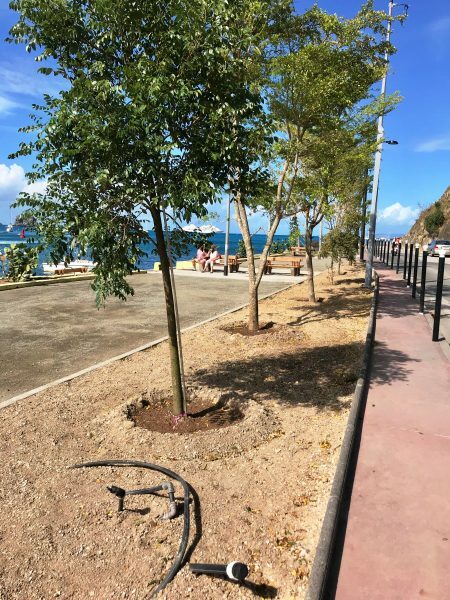 On our way into Gustavia, we noticed that the pétanque aka boules (bocce) courts are ready for play. 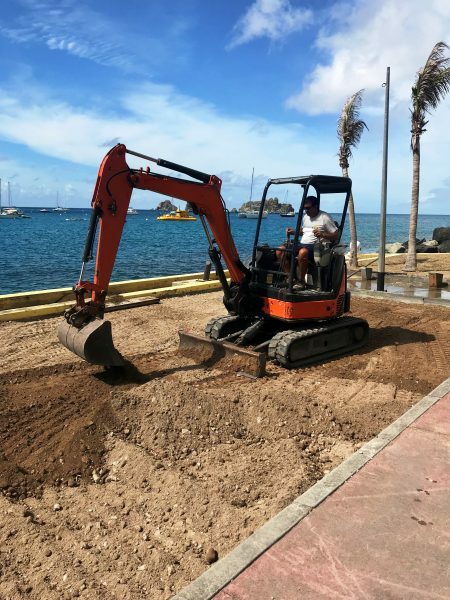 St. Barth fixed the boules courts, too. Have a seat on a bench and watch an early evening boules match. We had lots of very productive meetings with the staff at our rental office as well as our Sotheby’s sales office. 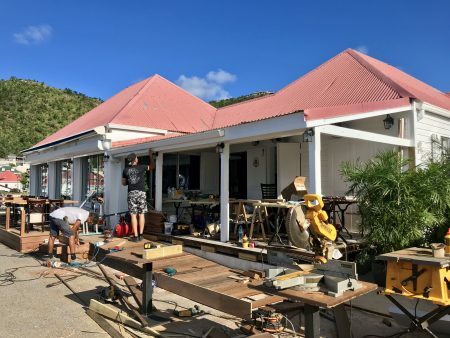 It was a bit noisy, because there were at least 10 men working on the Baz Bar’s rehab and about the same number of guys working on getting La Bagatelle restaurant ready for its reopening on December 14th. We visited villas, beaches and drove around the island. Tom was last here in October and the further greening of the island was well-noted. Everyday looks better than the day before. The weather has been so clear the last few days, it seems as if we can touch the distant islands. 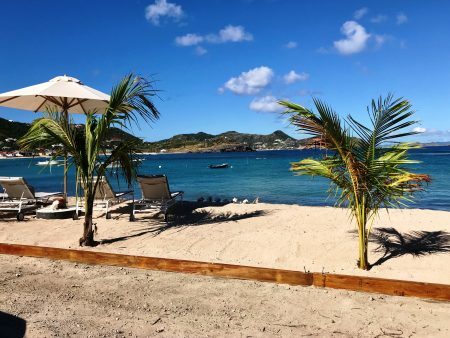 There were signs of the approaching holidays; people still booking villas at the last minute because they had to be in St. Barth to celebrate. 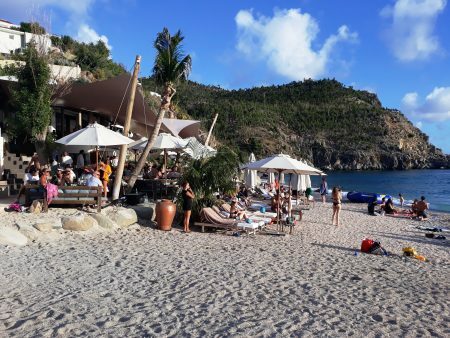 Roman Abramovich owns a villa behind Gouverneur Beach and always throws a big New Year’s Eve party in St. Barth. We saw his yacht anchored next to, and dwarfing, a cruise ship that was next to it. 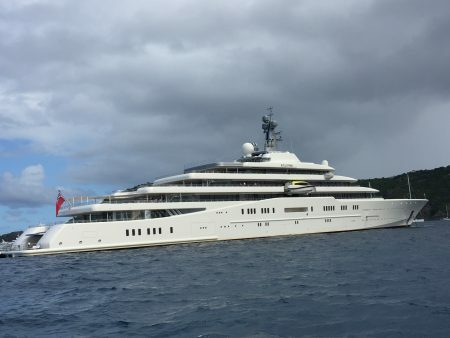 Roman Abramovich’s 538 foot yacht, the Eclipse is here. it is a beauftul sight to see. La Bagatelle reopened December 14th and we had reservations for dinner. As I mentioned previously, a crew, including our waiter, was feverishly working to finish it on time. Tom saw the state of it and told me we would not be dining there as it could not possibly be ready in time. I left the office to see for myself and took a photo. I asked our server, JC if I needed to cancel our reservation. He said, “Absolutely not. Come back in an hour and see for yourself.” So, when we left the office about an hour and a half later, I checked it out. At 11 minutes after three on December 14, 2017, Tom said to me that there was no way we would be dining at Bagatelle tonight. I took this after photo of Bagatelle 2 hours and 15 minutes later on December 14, 2017 – Incredible. Incredible! 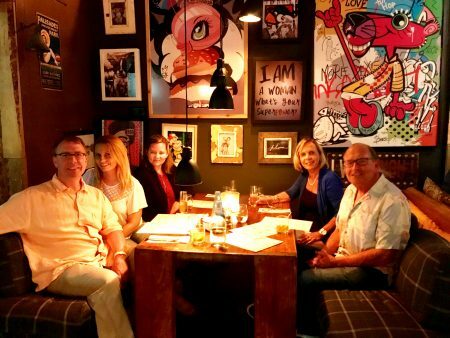 I had invited Dennis and Amy, clients of mine who were staying at Villa Les Embruns by Flamands Beach, to join us for a drink at the bar at 7:00 p.m. They were so happy that they had come to St. Barth. Dennis, said, “We have had a lovely week. 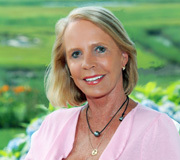 I cannot recall a time when the island was more welcoming. Thank you very much for all your help these past weeks with our visit which was the most unique experience among all our other many trips to St. Barth.” An hour later, we were seated for dinner. The place was packed – totally sold out. We loved people-watching and our meals were delicious. 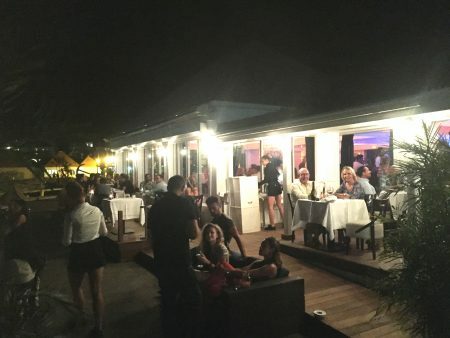 Bagatelle waa packed on opening night. As the days fly by I am still discovering new changes, so each time I go to Gustavia or somewhere else, I take a photograph for you. Orega opened just before Christmas. After dining at Eddy’s, we walked by. Greg pulled us in to offer us a glass of Champagne in celebration. It looks even better than before. There is a sushi bar at the entrance and the main dining room has more subtle lighting. I wanted to wait until after the holiday rush, so we are dining there tomorrow. I am happy to say that Orega opened Dec 21, 2017. You must dine here. The man-made beach area in front of Villa Brise de Mer looks so inviting. This fence is now up at the end of the runway. At least it will let the sand blow through it naturally. Steve and I were lucky to have our son, Mark Smyth, his wife Cynthia and our granddaughter Reegan join us for the holidays. We were able to play tourist with them and spent time on the beaches during the day, and dining out with them at night. They stayed at Villa Au Petit Pont, which is freshly painted and has renovated bathrooms. This was our view from Petit Pont on Christmas morning. We loved having Christmas dinner at Le Tamarin. 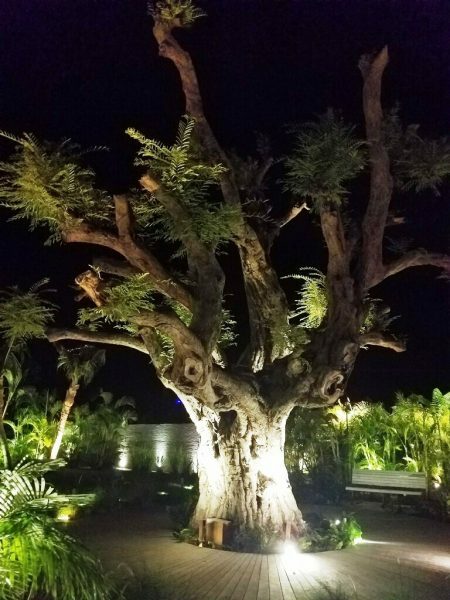 The famous Tamarin tree at Le Tamarin restaurant survived Hurricane Irma and is showing new growth. Things are picking up on St. Jean Beach. Tom Beach hotel has set up beach chairs, umbrellas, on a first come first served basis (20 euros) and there is a make-shift beach bar where you can get drinks and order some food supplied by Le Bouchon. The bartender takes your order, then a runner drives over to Bouchon and brings it back! Clever. 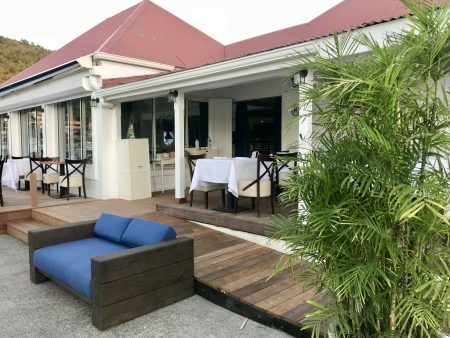 More towards the middle of St. Jean Beach, the new Lil Rock Beach Bar opened on December 23, 2017. Its lounge chairs are much plusher, and can be reserved by calling our concierge, Aurélie Janvier, at 35 euros per day. Their drink menu is less expensive than Tom Beach’s. If you are just looking to go there for a drink or some sushi and other fresh items, they offer tables and chairs where you may sit to enjoy the shade while having a drink and/or food. Further up, in the middle of St. Jean Beach, Lil Rock Beach Bar debuted December 23, 2017. Lil Rock Beach Bar on St. Jean Beach opened December 23, 2017. 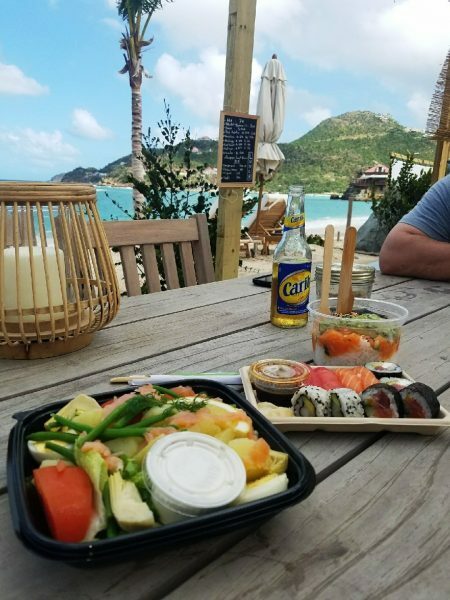 Lil Rock Beach Bar has tables, free of charge, where you can enjoy your drinks as well as sushi and other items. 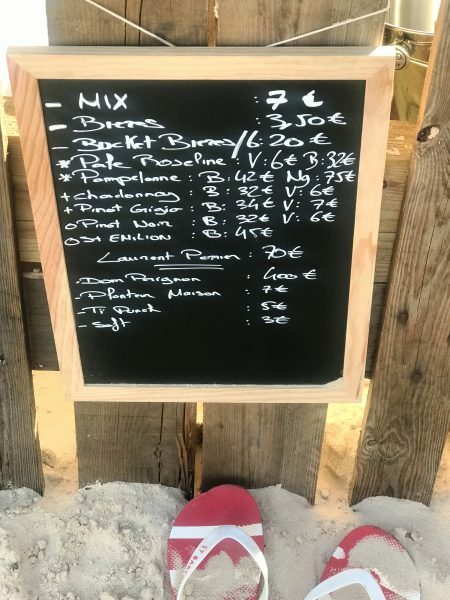 The drink menu at Lil Rock Beach Bar is very reasonable. 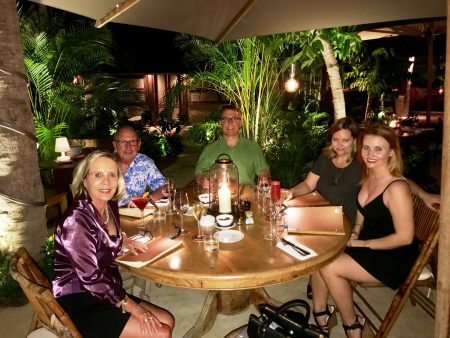 December 27th, 2017: We had a lovely early dinner at L’Entracte because, as promised, Jimmy Buffett gave a free concert on the quai to support the people of St. Barth who worked so hard on the recovery of the island. Residents, tourists, including parrot heads, flocked to the quai to hear Jimmy and Soley belt out fabulous tunes. Jimmy sang songs about St. Barth, like Autour de Rocher (a nightclub I remember well, before it burned down many years ago). Most of us sang along. Thank you, Jimmy and Soley! We enjoyed a pre-concert dinner at L’Entracte. 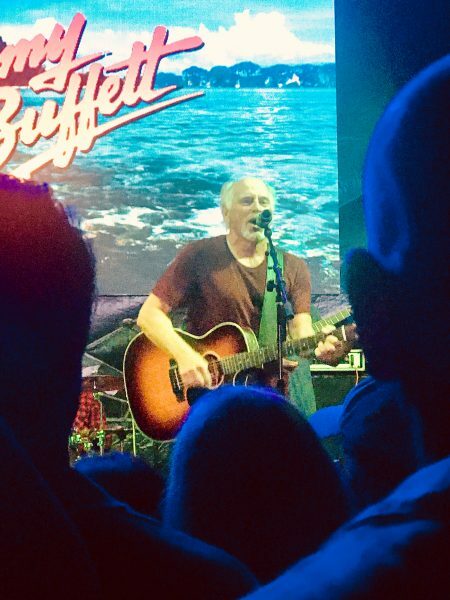 12-27-17 Jimmy Buffett gave a fabulous free concert on the quai. Just before New Year’s Eve, Shellona reopened with great fanfare. The place has been full ever since. I am sure that this Shell Beach bar and restaurant will have a very successful season. You must try it! As of December 28, 2017, Shellona is open for business. Enjoy! New Year’s Eve was as festive as ever. The fireworks did not disappoint, and it seemed as if the entire island came down to Gustavia with a bottle of Champagne to toast in the New Year and wish Bonne Année along with giving kisses on each cheek to anyone who passed by. I know that so many of you are suffering from bitter cold and lots of snow – it is only early January. Why not book your St. Barth vacation right now? 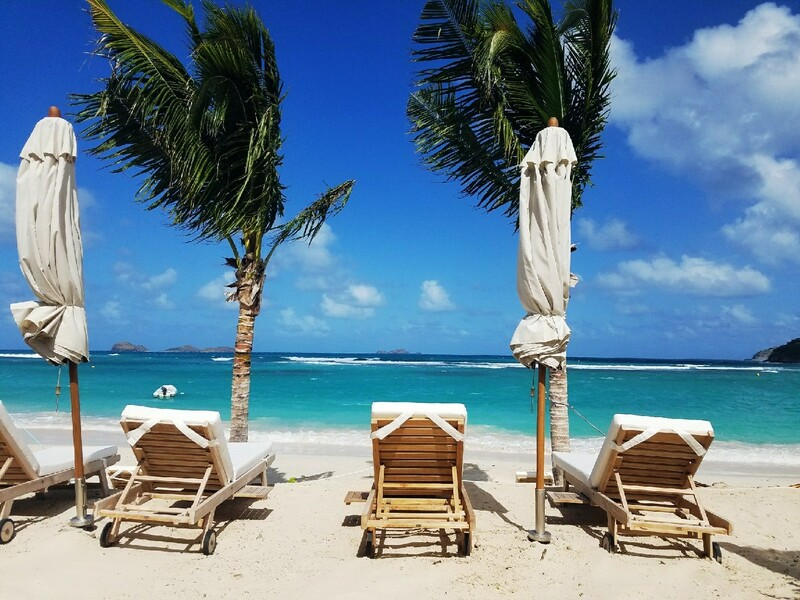 Email me pegwalsh@stbarth.com or reservations@stbarth.com. If you are looking to stay in a 5-Star hotel, the Christopher is reopening February 20, 2018! We will be pleased to book a room for you. 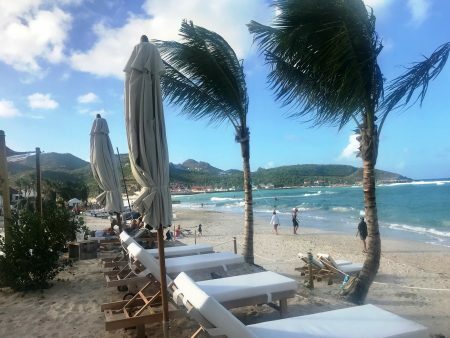 This entry was posted on Friday, January 5th, 2018 at 12:24 pm	and is filed under St. Barth Restaurants, St. Barth Trips. You can follow any responses to this entry through the RSS 2.0 feed. You can leave a response, or trackback from your own site. Are there any pictures of EMERAUD PLAGE Hotel. We stayed there several times, last visit was in February 2017. We know it was damaged badly. Hopefully the reopen soon. 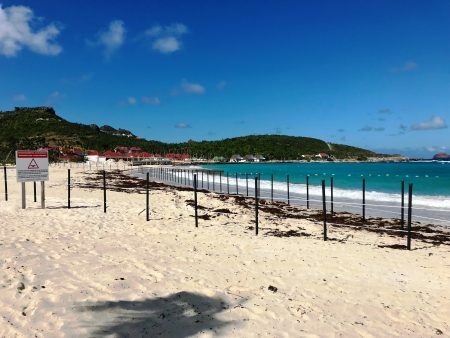 Unfortunately, nothing has been done to repair Emeraude Plage since Hurricane Irma. It was badly damaged. I am trying to get more information on whether a management company might be taking it over or it is being sold.